Monitors comes in various sizes and designs. Trend of curve monitors has recently increased. 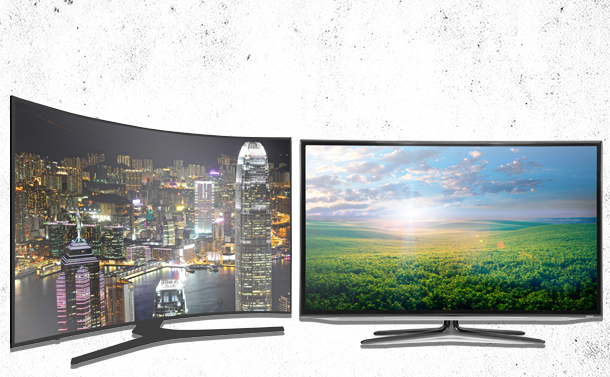 Many big names have launched curved monitors to compete in the market. But the question arises, that if they are worth it or not. There are different factors that need to be compared between flat and curved monitor to understand the difference between them. As of now flat monitors are preferred over curved monitors. We have listed some differences between flat and curved monitor. Curved displays provide wider angle for viewing. Flat screen monitors are just normal and do not give any wider viewing experience whereas due to the curved shape of the curved monitor you get wider viewing angle. Curved monitor provides better viewing experience. It provides good 3D experience due to the curves on the sides. However, for the noticeable difference the screen size should be big enough and the person needs to sit very close to the screen. Flat screen monitor also does the work and until the screen size is 27 inches or lower, then you will not notice any difference. Flat and curved monitors react differently to reflections. On the flat screen reflections will be normal, whereas on the curved screen it will be more stretched and distorted. Reflection is not a major issue, you can place the monitor in such position where there is less reflection. You can also cover your room so that there is less light coming in the room. Curve monitors do not go well with multi monitor display configuration. When using multi monitor you have to sit in alignment with the center of the screen, but due to curve in the screen you cannot set multi monitors together. However, if you use flat monitor you can easily set multi monitors together. Distortion occurs on the curved screen due to its shape. Some users claim that pictures are distorted where the screen is curved. And in the flat screen monitor pictures cannot be distorted. However, many people do not even notice it and cannot tell any difference between them. Curved monitors are more expensive than Flat monitors. However, curved monitors are getting cheaper and closer to the price of the normal flat screen monitor. Curved monitors are not for everybody. If you are into gaming and mostly live in front your monitor with single monitor configuration then curved monitor should be your choice. On the other hand, if you use your system for other purpose than gaming with multi monitor configuration then you should stay with flat screen monitor. Technology: Feminism's Greatest Friend or Deadliest Foe?